Plugging in the right keywords and key phrases for your articles just got a whole lot faster. If you’ve been reading this blog for any amount of time, you know that we frequently extol the virtues of balancing speed and quality in your articles. The key to success is to quickly produce a lot of high quality articles in the shortest amount of time. Late last week we introduced a new tool on the Submit a New Article page that promises to improve both speed and quality – the Keyword Field Helper. It’s FAST! – Instead of skimming your title and article body looking for great keywords to put in the Keyword field, you can just click on the keywords in the helper box and add perfect keywords and key phrases FAST! Get More Targeted Traffic – Keywords and key phrases are suggested based on the words of your title, summary and article body. Better keywords means more, and better targeted, traffic. The Choice is Yours – You can use the suggested keywords, supply your own or use some of each. Remaining Characters – A interactive countdown is given of your remaining characters in the keyword field (100 max.). Title Weight vs. Body Weight – Keywords or phrases contained in the title are given 3 times more weight in the keyword suggestion algorithm than those found in the body or summary of the article. Article Size Matters – Since short articles don’t typically generate high-quality key phrases, only keywords are used for articles shorter than 1,400 characters (~280 words). Expect Only the Best – Only high-value key phrases will be suggested. If none are found, none will be suggested. 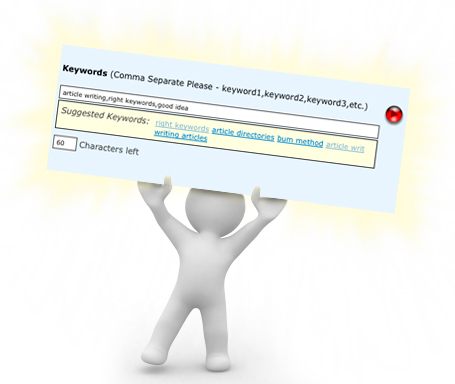 High-Value Key Phrases – Key Phrases that also contain top keywords are more likely to be suggested by the tool. One of the first things you’ll notice about this new tool is that you really don’t have to do anything special to use it. You simply submit your articles in the usual manner, except now when it comes time to supply the keywords and key phrases, we’ll be able to give you a little help. So don’t let the following (13) steps scare you. Even though it’s a bit difficult to explain, it’s really quite easy to do… plus it’s fast! We’ve tried to make this new tool as quick and pain-free to use as possible while still making it both powerful and flexible. Leave a comment to let us know how we did. And if you do find any oddities, please let us know that as well. I love it!!! It makes submitting keywords so much easier. This was a feature we started dreaming about 3 months ago. We had a few false starts on rolling it out where it wasn’t providing really good data. Open to hearing how (if at all) you’d like to see this tool improved. Our goal with this tool is primarily to make submitting your articles to become a faster experience with a secondary goal to improve the quality of the keywords and key phrases being included in the keyword field. I’m not convinced the keyword field is hyper important because it’s only 1 out of 100+ elements that helps the search engines to figure out what a page is about; so this tool doesn’t present any downsides because you can always disagree with the keyword recommendations and include your own anyway. Bottom line = Speed…so you can focus on writing more top notch quality content without worrying about which keywords to include. This looks to be a useful feature, one which I`m looking forward to using on my next article submission. Interesting and helpful tool to help speed up the submission process. Thank you. Saves alot of time! And it is effective as well! Yes, this has helped save me time in posting, and it does a pretty good job too. Very excellent solution. I’ve been noticing it the last few days and I like it very much. It seems to be making good suggestions. Thanks to remind me of tis tool. I noticed it when I first submited the article. I absolutely LOVE this feature! LOVE it! Thanks for all you do to make article marketing a little easier for us! I await my outcome of my first submission to EzineArticles, hopefully as accepted, but mindful now that format is important, not just the content. Thanks for this great feature. It save us lots of time. I usually have a pretty concrete idea of what my keywords should be fore each article, but this tool gives me the option of moving through the submission process that much faster. I love the suggested keyword tool especially for newbies who have no idea or any inclination to learn anything about keyword research. My folks will love it. Great job as usual! This is awesome. I don’t have to think are the best keywords I need to put on keyword tag. Thanks for sharing this. Thank you Team EzineArticles , for providing such a good feature. This is a welcome feature. Depending upon your product or subject matter, keywords can be ‘niched’ so that although the masses may not reach your site, the ones who are really looking out for what you offer, will. Excellent tool! Thanks for continuing to improve our Ezine Article experience. This article was a MUST have for me! I am just getting started with copy and I plan to use Ezine. i will definitely have to bookmark this blog. Keep up the good writing!! I really like the feature, but ever since it was added I’ve been having problems with Author Area interface. It’s painfully slow to type anything in the author area, and even copy/paste is troublesome. I’ve only tried with Firefox and might be a browser issue. Yes, I was taken by surprise in my last submission as keywords and phrases were just there. In a moment I knew what to do. Great. Definitely saves time and gives more choice. It’s not binding too. We can select some and put our own or select them all. Sorry, I was late to react. Thanks for the comment. We are looking into it and we’ll let you know if there is/was a problem. It’s a great feature. Recently I saw this feature while submitting an article. It help to choose important keywords to article which we may not think. Simple and fast. Thank you. Oh yes, this is a feature that is actually useful and usable. Definitely very powerful and flexible tool for us.Thanks . Any feature that saves time and effort in article writing is welcomed. I really like the key word application makes writing an article a lot simpler for a newbie like myself. I vow to keep writing and improving my skills on many different topics. Thank you EzineArticles. wow thanks, submitting keywords is so much easier now. Thanks for the post. It’s really helpful. I am going to use it in my next article submission.